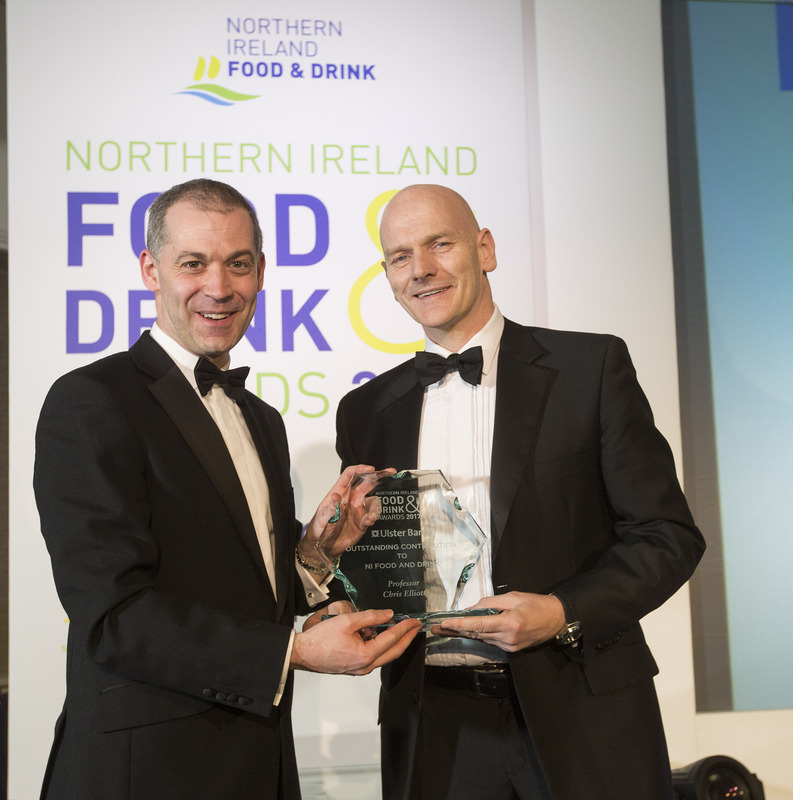 The 14th Northern Ireland Food & Drink Awards served up a celebration of innovation, quality and export success as leading local food and drink companies were recognised at an awards ceremony in the Crowne Plaza Hotel, Belfast. The awards are recognised as a crucial measure of commercial success for local food and drink manufacturers and processors, offering companies the chance to showcase their commitment to excellence in front of key industry stakeholders and customers. A total of 11 awards were presented at the event, which was attended by over 350 guests including major retailers, government officials and industry leaders. There were two winners in the ‘Ulster Bank Best New Product in a Large Company category’ – Dale Farm was awarded the prize for Protein Milk, along with Linden Foods for its Lidl Dry Aged Steak range. The award for Best New Product in a Medium Company was scooped up by Scott’s Bakery Gluten Free Range, while Pop Notch won the Small Company category. The Food NI People’s Choice Award went to the ever popular Thompson’s Punjana tea. Other award winners on the night included Linwoods, picking up the Invest NI Export Excellence Award, Moy Park, winners of the Safefood Best Innovation to Enhance Food Safety Award and Dunbia, winnners of the DAERA Agri-food Supply Chain Excellence Award. Professor Chris Elliot, Director of the Institute for Global Food Safety at Queen’s University Belfast was presented with the Outstanding Contribution Award. Laura Hook of Dale Farm was recognised with the Food and Drink Sector Skills Ambassador Award, Suki Tea was presented with the Food and Drink Sector Skills Training Excellence Award, and Kettyle Foods picked up the Deloitte Service Sector Award. “These awards are among the most important in Northern Ireland’s entire business calendar, as some 100,000 private sector jobs depend on the agri-food supply chain. The industry has a turnover of £5bn every year, so its importance cannot be overstated. “On behalf of NIFDA, I’d like to congratulate all our award winners, those who were specially commended and indeed everyone who was lucky enough to be declared a finalist at this prestigious ceremony. These local companies are trailblazers in the international food and drink sector, leading the way in agri innovation, education and supply chain excellence on the world stage, so it’s only right that we celebrate their achievements.